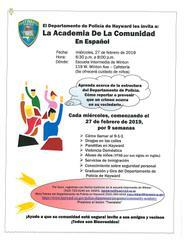 Attend the Hayward Police Department’s Community Academy IN SPANISH! For Spanish, click on “Translate” in the upper right-hand corner of the website page. Child care provided! Participants in the program must be at least 18 years old.